CONWAY, Ark. (CNS) — For 20 years, Bradley Fornash worked at the Conway Police Department, including 17 years as a hostage negotiator and 13 as a detective. Today, it’s less about diffusing life or death situations and more about solving conflicts. Instead of investigating crimes, he’s monitoring the playgrounds. Rather than interrogating criminals, he’s a mentor to students who need it. Fornash, hired in August, is the first school resource officer for St. Joseph School in Conway. 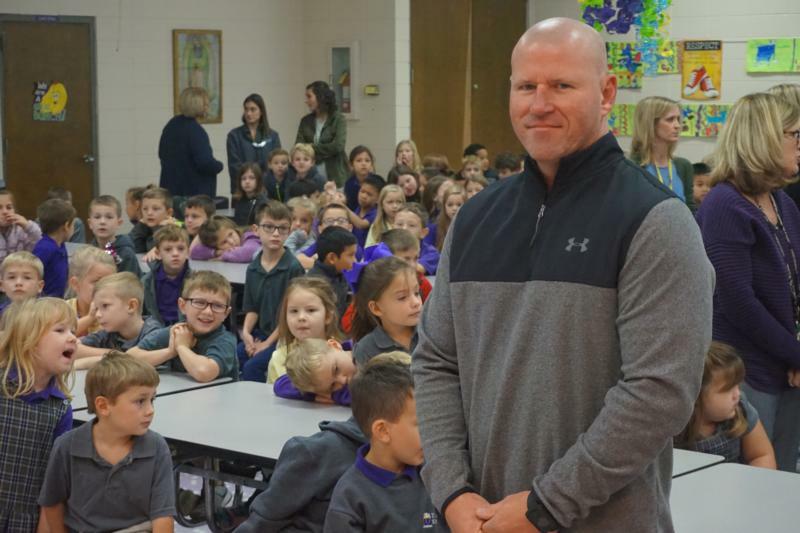 He is the only resource officer in the 28 Catholic schools in the state. St. Joseph has an elementary school, middle school and high school. “I feel like there’s more responsibility here than there actually was at the police department, because there’s so many kids I feel like I have to keep them safe,” Fornash told the Arkansas Catholic, newspaper of the statewide Diocese of Little Rock. The joke soon became a real conversation with high school principal Diane Wolfe, who was on board from the beginning. Pope said Fornash was perfect for the job because he already knew the culture of the school and parish. His duties vary throughout the day, from walking about seven miles a day or riding in a golf cart around the perimeters of the school buildings, assisting with pick-up and drop-off at the elementary school, monitoring recess for elementary and middle school students, and being present at lunch for middle school and high school students. He was instrumental in getting a gate to regulate traffic by the elementary school for safer school drop-offs and requesting a radio, which other area schools also inquired about following his lead, that connects him immediately to city dispatch if there were an emergency. Pope said his versatility and willingness to help in any way has been a positive. “I can call him after hours and run something by him and he truly thinks about it, all scenarios, and sometimes he’ll say, ‘I’m not sure, let me think about it and get back to you.’ So he’s very reflective and makes the best decisions for our school,” she said. While his job duties continue to evolve, Fornash has made it a point to provide more safety programs for students. He’s helped bring in both officers and a judge to speak on internet and phone safety, drugs and on Nov. 5, the school’s first Conway SWAT-led intruder safety training. It has been tough for some students to shed the notion that Fornash is no longer an “officer” in the police sense of the word, but they are warming up to him thanks to his commitment to approachability, even weightlifting with student athletes on occasion. He said there are a few “I talk to on a regular basis that need guidance” and if more is needed, he’ll refer them to the school counselors.